Last week Grub Street broke the news that Num Pang would be launching a new program called “Guest Chefs Give Back”, featuring limited edition sandwiches created by famous chefs for charity. Well, the first new sandwich will hit the menu on Wednesday courtesy of Mario Batali. The “Batali Pang” (as it’s being called) will cost $9.75, and proceeds will be divided equally between Chef Batali’s cause, Food Bank For New York City and Ratha Chaupoly and Ben Daitz’s cause, The Cambodian Children’s Fund. But what exactly is the Batali Pang going to be?! Try cotecchino sausage by Brooklyn Bangers with balsamic pickled onions and Cacio de Roma cheese, folded into the traditional Num Pang ingredients – homemade chili mayo, pickled carrots, cucumber, cilantro and served on a toasted semolina flour baguette. It will be available at all Num Pang locations from February 15th through March 15th. Posted by The ML Team at 9:45 am, February 9th, 2012 under Num Pang. 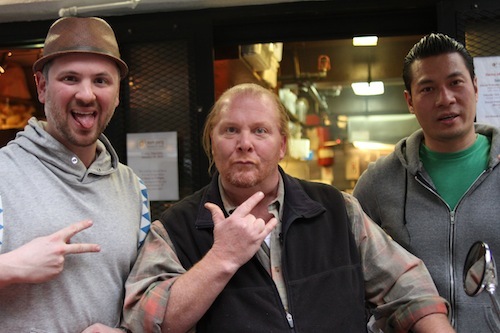 Maybe it’s the hard rocker hand gesture but Batali kind of looks like a middle aged Axl Rose. I expect something more exotic like blood Oranges and CROCodile meat.